Senator Bernie Sanders wants President Donald Trump to know that he reads Trump’s tweets—especially those with promises the president is breaking. On Tuesday, Sanders took to the Senate floor to remind Trump about his tweeted vow to not cut social welfare programs—something that’s set to happen under the Republican tax reform plan. For too long biking has been viewed skeptically as a white-people thing, a big city thing, an ultra-fit athlete thing, a twenty-something thing, a warm weather thing or an upper-middle-class thing. And above all else, it’s seen as a guy thing. But guess what? The times, they are a-changin’. More than 100 million Americans rode a bike in 2014, and bicycles have out-sold cars most years in the U.S. since 2003. Broward County teachers will receive raises this year ranging from 2.6 percent to to 3.51 percent, under a tentative contract between the school district and the teachers’ union. Broward County landlords can no longer refuse to rent to someone simply because that person is a military veteran or domestic violence victim. Broward commissioners unanimously voted to expand the county’s housing anti-discrimination regulations Tuesday to ensure military personnel and returning veterans have access to housing and that victims of domestic assault aren’t victimized again. In their efforts to discredit renewable energy and support continued fossil fuel burning, many anti-environmentalists have circulated a dual image purporting to compare a lithium mine with an oil sands operation. It illustrates the level of dishonesty to which some will stoop to keep us on our current polluting, climate-disrupting path (although in some cases it could be ignorance). Sorry, kids. If you attend Broward County public schools, summer vacation will end early. The School Board on Tuesday approved its calendar for the 2018-19 school year, which will start Wednesday, Aug. 15 — six days earlier than last year. It’s also the first midweek start in recent years. The start of the school year has been a contentious issue over the years. District officials say an earlier start is better for academic purposes. But a number of parents say later starts help avoid conflicts with out-of-state camps, family trips and academic summer programs. It’s safe to say that lobsters aren’t a budding new demographic for soda companies. So why did a lobster recently caught in the waters off Grand Manan, New Brunswick, have part of a Pepsi logo tattooed on its claw? That’s a question that baffled Karissa Lindstrand, the fisherman who spotted the uncanny image during a lobster haul, according to the Guardian. Lindstrand happens to drink up to a dozen Pepsi sodas a day, but she was struck by the image’s unusual dimensions. There’s nothing quite like a cup of coffee in the morning. Whether it’s from your local shop, brewed at home or snagged from a tiny cart somewhere, people all over the world start and their days with the centuries-old psychoactive beverage. And aside from being a the only thing that can drag some of us out of bed on tough mornings, there are actually some more significant reasons—including health, economic and more—why it’s a good way to start your day. FORT LAUDERDALE, Fla. – With temperatures expected to drop this weekend, Broward County has declared a Cold Weather Emergency for Saturday and Sunday. The National Weather Service is forecasting temperatures to hit the mid-40’s in Broward metro areas when including wind chill. It is time to get those holidays gifts in order. A glass bottled hand soap is a great gift for anyone on your list! 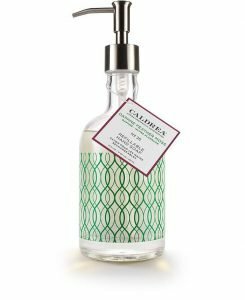 Caldrea’s Daphne Feather Moss is the newest scent we have in the showroom!. Aloe Vera Gel, Olive Oil and essential oils cleanse and condition.